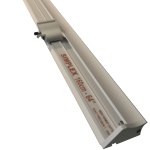 Keencut Simplex’s innovative design offers exact accuracy for general purpose cutting of Lampshade and wide format materials up to 1.1mtrs wide. The Simplex is lightweight, portable, and perfect for cutting Lampshade materials PVC Foamboard, Vinyl, Woven Fabrics, Foam Centred Board, Honeycomb and Corrugated Plastics, Film, Paper and many more flexible and rigid display materials. The Simplex uses utility knife blades and features blade depth adjustment and a spring-loaded blade ejector as standard. The utility blades will cut to a depth of 10mm (0.4”). The patented linear bearings have been tested under load for 1600km (1000 miles) and carry a 20-year guarantee. Full-length silicon rubber grip strips ensure all work is clamped when cutting and also protect the surface of the material being cut.